“Take a team’s picture, and they’ll be happy for a day. Teach a team to build a selfie-taking machine, and they’ll win the 2017 Alumni Cup,” as the old saying goes. This year’s Alumni Cup celebrated its sixth year with a unique challenge: build a machine that would take a selfie. And for the first time, the Fischell Department of Bioengineering celebrated its win over eight other department teams. Alumni Cup is an annual engineering design competition that was started in 2012 by the Engineering Alumni Network. Teams of students from each Clark School department compete against one another for engineering dominance in a week-long challenge that tests their creativity, problem-solving, and teamwork abilities. They must develop a Rube Goldberg-inspired machine that will complete a specific task within certain parameters. Alumni Cup serves as a way to engage students and alumni in a weekend where competition and fun are not mutually exclusive, as well as bring awareness to the Alumni Association. Heather Medina, director of alumni engagement and outreach at the Clark School, says relationships with the Clark School don’t end at commencement; they are relationships for life. Teams are judged on an oral presentation, the functionality of their machine, and their spirit and theme. The challenge of taking a selfie must have been achieved by executing 20 unique steps in under 90 seconds, and the selfie must have contained three team members and a part of their machine. Some teams took their challenge a step further to stand out. The Department of Electrical and Computer Engineering’s machine took a selfie, and then immediately posted it to Twitter, tagging the Alumni Network and the Clark School. “What was really exciting was to see all the students out there, even those not competing, to support other students ... and how much they really got into the concept of the selfie. They really embraced it,” Medina said. Competition manager Jeffrey Karceski (B.S. ‘88, nuclear engineering) says the Alumni Network is extremely proud of the efforts by each team and their machines, which reflected the originality, creativity, and ingenuity of each engineering discipline. Bioengineering team captain Shannon Larson competed in last year’s Alumni Cup and incorporated what she learned into this year’s win. Given the tight deadline, the team worked in shifts around classes and late at night. Larson said this stressed the importance of refraining from overcomplicating the machine and focusing on the bigger picture. 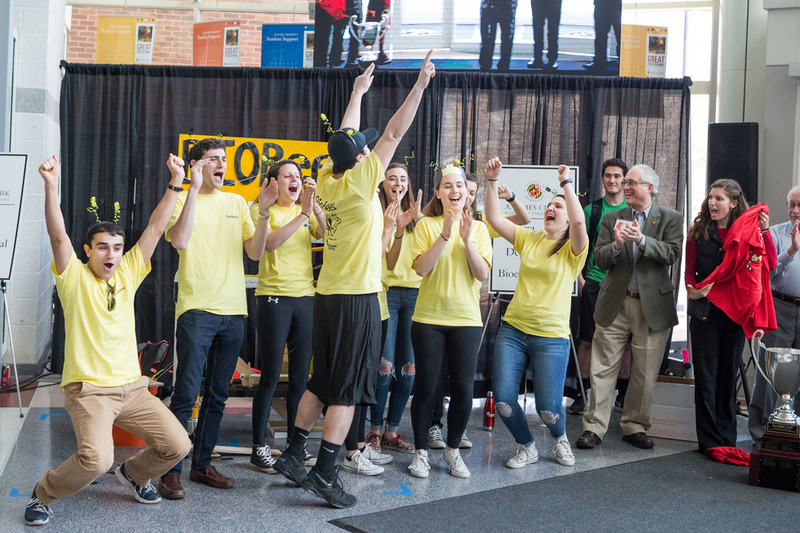 Bioengineering’s “BioBees” machine was the only machine during the competition that completed its tasks as predicted without interference. Larson credits the team’s success to the support of other bioengineering students, and the department faculty and staff. Relationships with the Clark School don’t end at commencement; they are relationships for life.